Introduced in 1960 the R60/2 was slightly more powerful at 30hp than its 28hp R60 predecessor, while the power output is not particularly impressive the durability and smoothness and torque of the 600cc boxer engine is. Still good for about 90mph these bikes continue to be a great ride as well as being a bit of a ‘classic’ bike style icon. So popular was the R60 model that it was produced from 1956 to 1969 with an estimated twenty thousand built. 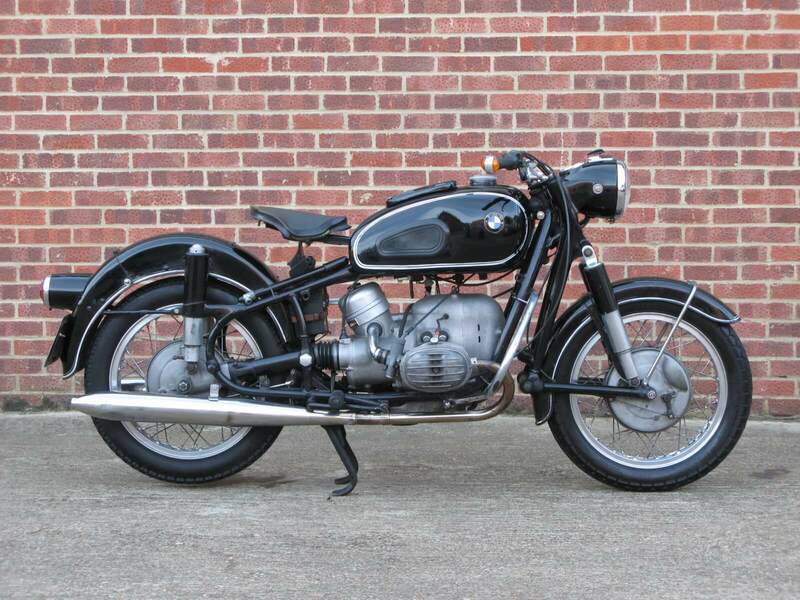 This example from 1964 is a matching number bike with 5 previous owners. In good running order it is fitted with the larger 6 1/2 gallon fuel tank which is in good condition and still has it’s original alloy wheels. This bike appears largely unrestored so the paint on the frame and the mudguards is chipped and scratched but overall the bike appears ok, so a good ride or restore bike, suppled with a few old MoT’s and the UK V5C logbook.